From the authors of the New York Times bestseller The Exception to the Rulers comes a new book that pushes back against official lies and spin to give voice to the silenced majority. 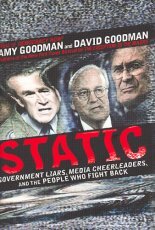 In Static, the brother-sister team of Amy Goodman, host of the popular international TV and radio news hour Democracy Now!, and investigative journalist David Goodman takes on government liars, corporate profiteers, and the media that have acted as their cheerleaders. With cogent analysis, riveting stories, and a stark review of the facts, the authors expose how the Bush administration has manipulated and fabricated news, and how the corporate media have mainlined their lies onto the front pages and into new broadcasts. Cutting through the spin and static to offer the reality about war, torture, and government control of the media, Static presents voices of dissidents, activists, and others who are too often frozen out of official debate. Moving from the Katrina catastrophe through NSA wiretapping and the disastrous war in Iraq, from U.S. government-sponsored torture in foreign countries to the Bush administration's weeding out of citizens with dissenting views from supposedly public forums in this country, the Goodmans offer chilling examples of the ways in which the truth has been buried under an avalanche of deception. Most important, Static spotlights the brave actions of those individuals who are demanding that their voices -- and the truth -- be heard. Ultimately, Static is a hopeful, fighting rallying call for voters to counter the lying, spying, and dying by taking back our government, our media, and our world.